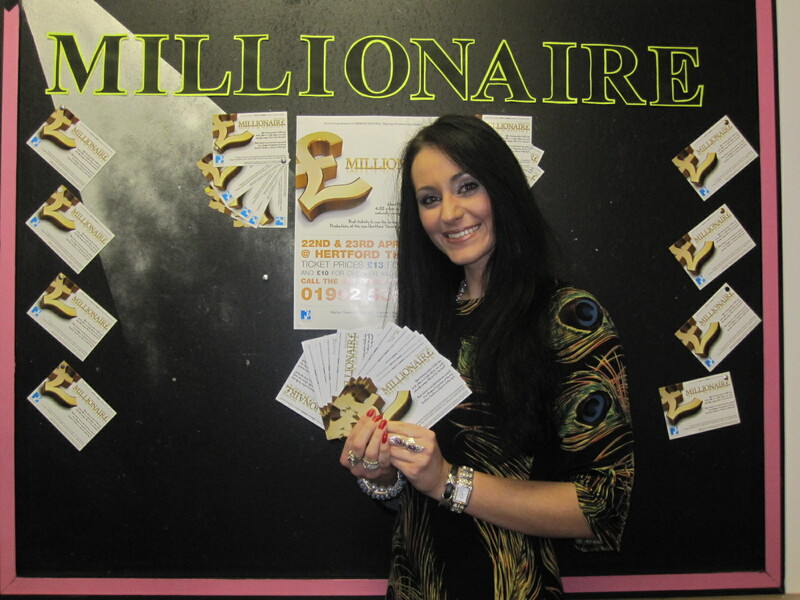 I’m still buzzing from the fantastic production of Millionaire at Hertford Theatre over Easter weekend. I was commissioned to write Millionaire by Mayhem Theatre Arts; an exceptionally talented group of performers. The musical centres on Stella, a factory-worker who is bored and frustrated with how her life is going. Having spent her whole life living in a grim Northern town, she dreams of swapping her mundane existence for one full of glitz and glamour. Her dreams come true when she scoops £32 million in a triple-rollover lottery draw and a production company make her the star of her own reality show. But does she know what she’s letting herself in for? Mayhem Theatre Arts is a multi-talented organisation and Millionaire was written to showcase the skills of the performers to the best of their ability. With a cast of over fifty people and featuring music and dances to suit all tastes, the show aimed to include something for everyone. Mark Neville did a cracking job of directing the show; god knows how he found the energy to also be in it as well! Around 800 people came to see the show and I’ve heard nothing but great feedback about the spectacular performances. Alison Latchford was the perfect leading lady both on and off stage, and captured Stella’s personality perfectly. Tara May (who was also MD) put in a memorable performance as Selina, the bitchy diva who makes life difficult for all those around her. Tara’s rendition of Queen’s ‘I Want It All’ will long be remembered. Louis Purves and Alison Latchford’s version of Adele’s ‘Someone Like You’ has been chosen by many as the highlight of show. It was absolutely note-perfect and sung with such tenderness, that there weren’t many dry eyes in the house! As for the dancers, Nicole May did a sterling job of choreographing and managed to include a vast range of styles. From tap to street, Millionaire had it all! Andy Barke and the Street Dance troupe were are real crowd-pleaser, wowing the audience with their perfected routines. The audience were in awe of Sean Ball and Michael May running up walls and doing back flips, and gasped when little Grace Neville was being swung round at death-defying speed.